One thing last night's John McCain acceptance speech was not, we are compelled to admit, was a stemwinder. McCain has been known to give more compelling addresses, but for the most part he did a good job of laying out the case for himself over Barack Obama. What John McCain delivered was a "safe speech." Throughout the Republican National Convention, the McCain campaign has done a good job of leaving the direct attacks on Obama to their surrogates-everyone from Mike Huckabee to Rudy Giuliani to Sarah Palin. Those speakers delivered attacks on Obama that were not only scathing, but effective. The party managed to use the platform provided by a national convention effectively to put huge holes in the opposition's armor. The biggest problem for the GOP is how the networks cover the convention. Mike Huckabee's speech, for example, was not carried in full by any of the three major networks, and among the cable news channels, some carried part of the address while others carried none at all. If you want to see the convention for what it really is, as opposed to what the press tells you it is supposed to be, you must watch the convention on C-SPAN. Some of the most clear and effective speeches of the convention were never on major network television. Huckabee, of course, had one of the best speeches during the convention aside from Sarah Palin. Barack Obama’s choice of Joe Biden. voters. Biden is viewed favorably by 48%. The war is on, folks, and so much for the people who said that a Republican couldn't win this year. It is a new political ball game, and it is thanks in no small part to the Governor of Alaska. 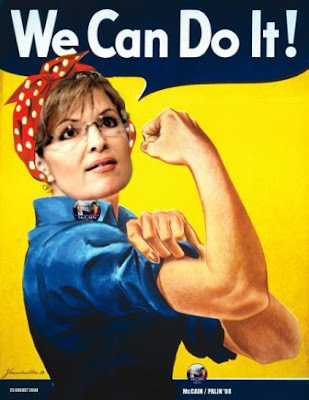 To say that Sarah Palin impresses me would be a major understatement. The party opposite flirts with the women's vote, but all they can offer women is abortion on demand and phony platitudes about feminism. Sarah Palin is one of these, and that is exactly why she was chosen to be our next Vice President. She is, like many other women in America, a wife and a mother, and she has a family of five wonderful children. Despite what certain people and disgusting tabloids may be saying, it certainly doesn't look like any of her kids have turned out all that badly. The wife and mother wasn't content with running the PTA, she wanted to make a real difference and she ran for City Council-and she won. Then she ran for Mayor, and she won that office too. She ran for Lieutenant Governor and lost, and then bounced right back and ran against a popular Republican in a primary, and she beat the man. She beat a two-term popular Democratic former Governor in the General Election, and still has managed to raise a family and have another baby. Apparently, some folks don't think her experience makes her presidential material. She ran a State that is over half the size of the Lower 48 combined, practiced energy independence and conservation, has managed a major budget, dealt with a sometimes hostile legislature, and still managed a family life? There are a lot of people who have been in public life for years and they haven't managed to do all of that-and those who have tried have not often been successful., but Governor Sarah Palin has. Pay attention to this lady...just as with Mike Huckabee, I think she'll be our nominee one day. We'll have a woman President in our lifetime-here's the woman. People wondered if she would deliver-and boy did she ever! It was to be expected that Governor Palin would deliver a good speech, but she didn't just do that-she brought down the house and won over a whole lot of people who had previously been skeptical of her. Barack Obama's surrogates in his campaign and in the press (which is almost universally friendly to him) have ridiculed Sarah Palin as a small-town Mayor who has no business anywhere near high office. As someone who is running for office in a small town and who hopes to serve in municipal government, I became deeply offended when I saw that these were the tactics that the Obama camp and their media friends were going to use. This line of attack has offended even Democrats in small-town America-what few Democrats that I've spoken with in our area who were open to supporting Obama seem incredibly turned off by the ridicule Palin has suffered at the hands of Obama surrogates for coming from a small town. Sarah Palin was right when she pointed out that they said the same kinds of things about another famous Democrat who was ridiculed for serving as a County Judge and then coming to the Senate with no experience, and being named the Democratic nominee for Vice-President when members of his party said he simply had no experience at all. Harry Truman came from what was then a small town, and in the light of history is now seen as one of the great Presidents ever to hold the office. Sarah Palin has more executive experience than Harry Truman did when he was nominated for Vice President. He had spent several years in the Senate by that time in his life, but his Senate career was unremarkable and he was barely noticed even by Franklin Roosevelt, who was extremely reluctant about the prospect of Truman as Vice President. Palin is correct: Being Mayor of a town the size of Wasilla has a whole lot more responsibility than being a "community organizer." While the party opposite belittles small-town officials, we know that people who have held elected office in small towns are the most prepared people in this nation for higher office because they know-more than anyone else-how their policies impact the people they serve, asthey must live with the consequences of those policies. Huckabee is right-our friends in the press have managed to unite the Republican Party in ways that none of us could have ever imagined. After the November election when Senator Obama returns to the Senate with his political tail between his legs after being taken to the woodshed, he can thank his allies in the press for making it all possible. I never thought I'd say this, but Rudy Giuliani gave an unbelievable address in which he pointed out that Barack Obama shirked responsibility at every turn. "I'm sorry that Barack Obama feels that [Sarah Palin's] hometown isn't cosmopolitan enough. I'm sorry Barack, that's it's not flashy enough. Maybe they cling to religion there." The more the Democrats open their mouths about Sarah Palin, the deeper the hole becomes that they are digging for themselves...so they can keep right on digging. Our friends on the Left, not content merely to try and discredit Sarah Palin based on accusations they cannot prove-or based on the mistakes of her teenage daughter-have now resorted to some of the lowest, cheapest, and dirtiest political tactics ever devised. The Alaska Democratic Party says that it did not release Governor Palin's Social Security number-but someone who clearly has an interest in the advancement of the Democratic Party did do this. As Erick Erickson pointed out, the Democrats have resorted to this kind of tactic before. As with the last known public example of these agents of Satan prying into people's personal information, the Democrats have denied having any involvement in the affair. Of course, when a Democratic Party official's lips are moving we know that he or she is telling a lie. The last time the Democratic Party got itself into this sort of dustup and denied it, the truth came out that the scum on the bottom of humanity's shoe hitherto known as the Senior Senator from New York was in possession of the credit report of a prominent Republican candidate, and he was aware all along that that candidate's Social Security number had been illegally obtained in order to snoop on that person's credit and other personal information. These living examples of Lucifer have absolutely no moral compass and utterly no shame. They are so desperate to discredit a decent human being in Governor Palin that they will stoop to any level to do so, no matter how ethically wrong or morally depraved-though moral depravity is not exactly at a premium among some of these people. The saddest part of all of this is that there is no small number of folks in this country who think that the kinds of tactics that the Democrats are resorting to (and yes, Obama is brilliantly allowing for all of this to go on while making himself appear above the fray) are perfectly acceptable. John McCain knew about Miss Bristol's pregnancy when he chose Sarah Palin. It was an act of great courage for the Palin's to share this with America. Of course the Left is having a field day with the news-which is more evidence that as well-meaning as some of these people are, they still just don't get it. The solution of our liberal friends might instead been for Bristol Palin to have her unborn child murdered by a hatchet doctor in an abortion mill, preferably without the need for parental permission. Some of them might have applauded the Palins if they had encouraged their daughter to do such a thing. It is the Palins' reaction to this situation that tells us all that we need to know about the suitability of this family for the pressures of high office. Most importantly, it speaks volumes about how important the sanctity of life is to the Palins. They aren't shutting their daughter and her child away as though she would be some embarrassment to them. I'm quite sure the Palin family already had the talk with their daughter about the mistake that she made-there isn't much more to say, she is willing to live with the consequences of her actions. The very reality that the Palin family is ready to support their daughter and encourage the birth of her unborn child is precisely what conservatives mean when we talk about family values and the importance of keeping those values and morals within the larger society. In the Leftist world of moral relativism, anything that Bristol Palin-or any other young lady in similar circumstances- might choose to do is just fine and dandy. Pleasure with no pain, actions without consequences, if it feels good do it-these are the true watchwords of the modern American liberal philosophy of life. The Palin family understands life a bit differently. They know that actions have consequences, and I am quite sure that Bristol Palin has learned that firsthand. These folks also have an understanding of the sacredness of humanity and human life that allows them-after the initial shock wears off, and the "I told you so" talk comes from Mom and Dad-to embrace this adversity, support Bristol, and look forward with anticipation to the birth of a grandchild that they are ready to love with all the affection in the world. At the root of this thinking is the forgiveness upon which the Christian faith that the Palins share is built. If God can forgive their daughter and God gave life to this child, how can the Palins not do otherwise? Those are real family values, and the Palins are a living example of those values before the entire world. Prominent religious conservatives, many of whom have been lukewarm toward McCain's candidacy, predicted that Palin's daughter's pregnancy would not diminish conservative Christian enthusiasm for the vice presidential hopeful, a staunch abortion opponent. Focus on the Family founder James Dobson issued a statement commending the Palins for "for not just talking about their pro-life and pro-family values, but living them out even in the midst of trying circumstances." The Palins are obviously a family that doesn't just talk the pro-life talk, they walk the walk-and pro-lifers really do appreciate that about them. That is precisely why this news will do absolutely no harm to the McCain/Palin ticket, and why it may actually help among conservatives. As for Bristol Palin: Young lady, there are now a whole lot of people you don't even know who are praying for you. New Mexico moves back into the toss-up category, but it may very well see-saw back and forth between toss-up and "leans Republican" before it finally closes. There is little doubt that the selection of Sarah Palin as his running mate is motivating the conservative base like nothing else could have done. Conservatives are absolutely thrilled by this choice, and as Adam Graham has pointed out, liberals are engaging in their own crude sexism against Palin. What is most intreaguing about the reaction of the Left is that they are growing increasingly desperate, realising that they can't attack Palin for her inexperience because she has more executive experience than the man at the top of the Democratic ticket. How desperate are the liberals? Alan Colmes has sunk to a new low, attempting to blame Sarah Palin for her youngest child's Down's Syndrome. "God is on our side?" The more some of these people squeal-and they do squeal like greased pigs at a county fair-it is evident that all of their talk about gender equality doesn't apply when the woman is a conservative. The Left is literally in panic mode that a conservative, pro-life, heat-packing evangelical may become the most powerful woman in the world-and she would have earned every bit of it. As for John McCain's decision to tone down the convention-I wrestled with it, because we'd all love to have a grand affair to launch this campaign. The more that I thought about McCain's decision, however, the more I realized that the welfare of our fellow citizens should be placed before our own political well-being. This is a disaster for all concerned, and people's minds are not going to be in Minneapolis today. On this Sunday night, let us pray for the people of New Orleans and the Gulf Coast with the coming arrival of Hurricane Gustav.